Two immersive projection enviroments, both unconventional, both exploring different methods of 3D and panoramic imaging, and both produced as art installations, are described. 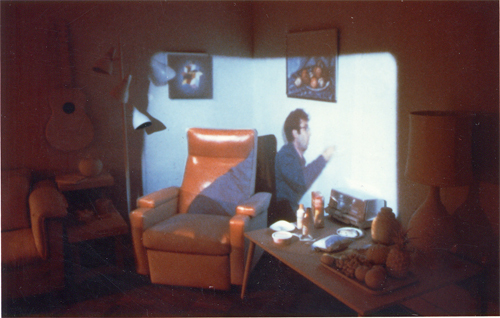 Displacements (1980-1984) re-created an interior living space using a panoramic motion picture method and relief projection. Be Now Here (1995-1997) re-created outdoor public plazas using a panoramic motion picture method, stereopsis, and 4 channel sound. Both installations were unusual, in that no intentions existed for anything more general or useful than the installations themselves as individual artworks. In 1977, I began to wonder why movie cameras move and movie projectors do not. As a graduate student at MIT's art center, the Center for Advanced Visual Studies, and like many young artists, old media was to be questioned and new media was to be explored. Cinematic forms in particular, ossified by a giant industry, were ripe for challenge and “expansion,” and a lively community of proto-media artists was pushing the boundaries (Youngblood, 1970). Across the street at MIT’s Architecture Machine Group, for example, a prototype videodisc player was on its way, and excitement was building around using this new device for experiments with interactivity. So it was not unnatural to question such basic tenets as why movie cameras move and movie projectors do not. The cheapest, fastest experiment was to mount a super-8 movie camera on a slowly rotating motorized tripod and shoot. The camera filmed at 18 frames per second (fps) on a small synchronous motor with a fixed rate of 1 revolution per second (rpm). Several different focal lengths were used. After filming, the film was loaded into a small film loop projector popular in classrooms at the time, and placed on top of a simple wooden turntable built around the same 1 rpm motor. One of the filmed focal lengths was within the range of the projector’s zoom lens. (Curiously, camera lens focal lengths are measured in millimeters and projector lenses in inches.) The focal length was roughly matched and the contraption was placed in the center of a square white room. With the projector on and the turntable off, the rectangular movie frame appeared in the center of one of the walls, projecting a more-or-less conventional panning shot of the Boston skyline. When the turntable was switched on, something magical appeared to occur. As the movie frame physically moved across the walls, the images inside the frame stayed put, i.e., images of stationary objects such as buildings, trees, etc., appeared locked in place with respect to the physical walls. One could, for example, walk up to the image of the Hancock Building and put one's finger on the image, and as the frame moved across, the image stayed on the finger. This effect, a spatial correspondence between the record space and the playback space, requires that the angular movements, frame rates, and focal lengths match. Over the next two years a more elaborate contraption was built to record the pan and tilt movements of the camera (via a gimbaled mirror), to drive the pan and tilt movements of the projected image (Naimark, 1984). I explored this new medium in terms of form and content and hoped it would be a useful new invention. The eventual conclusion was: New? Yes. Useful? Not particularly. These were the days before affordable video projection, before real-time 3D computer models, and when tracking devices such as the ones made by Polhemus were wound by hand and cost $75,000 each. I finally decided that making an artistic statement was more appropriate than making an impractical invention. Another form of alternative media I was concurrently exploring was what is sometimes called relief projection, where an image is projected on a screen whose shape is the same as the image. A grotesque but amusing example at the time involved projecting a movie close-up of a human eye onto a dome-shaped screen. But the Architecture Machine Group had an interest in "Transmission of Presence" at that time, and its Director, Nicholas Negroponte, and I flew down to Orlando to look at the famous "Talking Head" in Disney World's Haunted Mansion. A movie of a woman's talking face was projected onto a mannequin head in such a way that the eyes, nose, and lips line up. Our hosts at Disney World allowed us to view it for an extended period from behind a nearby security curtain. It was clear that as the woman spoke, the image of her moving lips would mis-register from the mask-shaped screen, but to most everyone viewing it briefly from their dark-ride car, this anomaly went unnoticed. Most people seemed convinced that they had just seen a full color, moving hologram (which, of course, is nonsense). Back at "ArcMac," a more elaborate version was built, whereby the filmed subject’s head movement could be recorded along with image and sound. Our subject, Professor Roy Lamson, was filmed using a super-8 sound film camera and a ($75,000) Polhemus device secured to the back of his head. A translucent mask of Lamson’s face was fabricated and mounted in a pan-tilt gimbal (if the truth be known, the same one built for my projection experiments, collecting dust). The film was rear-projected onto the face-shaped mask, which moved in sync with the image. The "Moving Talking Head," even with the obvious mis-registration due to the physical motion and filmed movement, was a popular demo at the time (Negroponte, 1981). 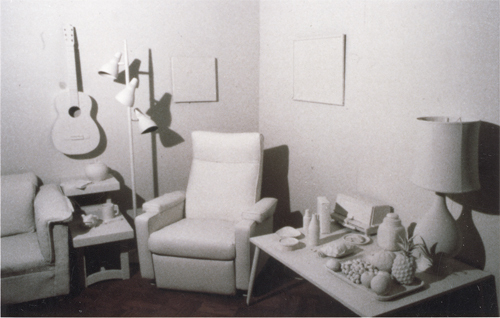 An opportunity to combine relief projection with a simplified "moving movie" arose for an art exhibition at the Aspen Center for the Arts called “Beyond Object” in 1980. The idea was to set up a typical Americana-style living room on-site, then to film with a motion picture camera on a slowly rotating turntable from the center of the space. After filming, a matched projector would replace the camera on the same turntable and the entire contents of the room would be secured in place and spray-painted white, to act as its own projection screen. A kitschy living room was composed, mostly from thrift shop finds, including a sofa, easy chair, several tables with ashtrays and junk food, wall hangings, etc., all situated around a working television set. Everything was placed against three walls, and the fourth wall was left blank. The hardware consisted of a 16mm motion picture camera crystal synchronized to record at 24 fps, a custom-built 1 rpm turntable, and a 16mm loop projector with a 24 fps synchronous motor. The camera and projector had near-matching wide-angle lenses (12.5 mm and 1/2 inch respectively) with an approximately 40-degree horizontal fields of view (FOV). 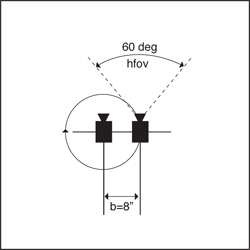 Figure 1: Schematic of camera and projection system. Figure 2: Spray-painting everything white to become projection screens. The installation, obediently entitled "Moving Movie," was almost entirely motionless, insofar as the rotating movie projector simply projected rotating imagery of the stationary furniture that occupied three of the four walls. With the direct comparison of subject and image, artifacts became amplified. For example, the frame rate of 24 fps was obvious. (Less obvious but noticeable to a careful eye was that the camera used a single-bladed shutter while the projector used a twin-bladed shutter.) Focus was an issue, since the depth of field of the relief projection exceeded the small depth of field designed into most projectors. If the rotational synchronization was off by even a single frame, the mis-registration was obvious. Still, the overall effect appeared successful. In what felt like a total violation of the concept, a performer walked along the fourth blank wall. Though she added some motion, she appeared simply as a flat projection in an otherwise 3D projection environment. A similar installation was produced the following year, with an intention, albeit apprehensive of the "distortional" effects, to integrate live performers (especially knowing that they could not be painted white!). This installation, with another general title, "Movie Room," also had one blank wall, on which three performers made such actions as spray-painting graffiti as the camera panned by. One insisted on sitting on the sofa during filming. Another snapped a Polaroid picture and stuck it on the blank wall during filming. I decided, after a great deal of "art anxiety," to keep the Polaroid picture unpainted. In the end, I was indebted to the performers. The graffiti action was striking but safe. The performer on the sofa appeared nicely ghost-like on top of the "very real" looking sofa. And the image of the performer holding the image of the Polaroid, walking toward the actual Polaroid, and placing it there - witnessing the moment where the image and object became one - was spine-tingling. This anomaly was integrated into the third installation, with little concern about violating the formalism of 3D representation. Another living room was installed, this time along all four walls. Lots of movable props were included: sweaters to take off, a purse, a globe to spin, junk food on the coffee table. Two performers were carefully scripted to move things around during filming. Ten different rotations were filmed. This installation remained a commentary on the passivity of our old media, challenging them with the rotating and relief projection, but it was equally about the anomalies, the displacements. The piece, entitled "Displacements," was exhibited in 1984 at the San Francisco Museum of Modern Art and was final. Figures 3, 4, 5: View of Displacements during filming, after being painted white, and with final projection. Eleven years later, I was unknowingly nearing the end of a two-decade investigation exploring how new media technologies could expand the range of "place representation." This investigation followed two parallel tracks: one based on panoramic or angular "look around," such as the “moving movie” work above; and the other based on lateral "move around," such as what came to be called "moviemaps." In both cases, the work had increasingly explored filming outdoor landscapes for immersive, sometimes interactive, art installations. I had just finished an immersive moviemap installation filmed with side-by-side cameras for stereopsis, the first-ever stereoscopic moviemap (Naimark, 1997). It seemed as if the last unchecked box of an invisible matrix was to make a stereoscopic motion picture panorama filmed in outdoor landscapes. I had also become increasingly politicized regarding content. The innocence and safety of filming along the Charles River across the street from MIT faded as I filmed more and more in other places, particularly in other countries. It became increasingly clear that whoever controls representation, controls everything (Naimark, 1998). In 1995, this final project took shape with the support of Interval Research Corporation and the cooperation of the UNESCO World Heritage Centre. Interval Research encouraged arts and media projects, particularly if the results could stimulate and cross-pollinate other research activities there. The UNESCO World Heritage Centre, in Paris, designates sites around the world with extraordinary cultural or natural value, including a lesser-known list of World Heritage site "In Danger." At the time, of the 440 designated World Heritage sites, 17 had been further designated "In Danger," and four of the 17 were cities: Jerusalem; Dubrovnik, Croatia; Timbuktu, Mali; and Angkor, Cambodia. Both spectacular and troubling, these cities would become the subject of this new project. The idea was to re-create simply "being" in these four cities, in public plazas that best represents them. Specifically, the plan was to work with local collaborators to find the most representative public plaza in each location, then to select one spot in each of these plazas from which to film. The goal was to allow "3D lookaround" via stereoscopic panoramas. Stereoscopic panoramas present a curious dilemma. Panoramic images are two-dimensional by nature, representing a single point of view. Two side-by-side panoramic images can be recorded for stereopsis, but the degree of disparity will change depending on the viewpoint, dropping to zero when the viewpoint is in line with the two cameras. Disparity can be kept constant by rotating the cameras about each other, but then the panoramic images no longer represent single viewpoints (e.g., circles may become ellipses). A small but lively community can be found on the Web making stereoscopic QuickTime VR panoramas by tiling together images using conventional cameras and living with the disparity or viewpoint artifacts. These images are usually viewed in stereo using red/blue anaglyph glasses. Several novel attempts have been made to build single stereo-panoramic cameras (e.g., Peleg, 1999). Two motion picture cameras would be used to record moving imagery, with the cameras side-by-side for stereo, rotating on a 1 rpm motorized tripod. The movie could appear to rotate around the viewers, like the earlier "moving movie" projects, revealing a panorama over time. John Woodfill, a computer vision colleague at Interval, proposed rotating both cameras around the nodal point of one of the cameras. Rotating about the nodal point of, say, the left camera would result in a perfect single-viewpoint representation that could be used for further experimentation. One might speculate that looking at a stereoscopic panning movie where one eye sees no disparity and the other eye sees all the disparity would be noticeable. But one could counter-speculate that it's possible to sit on a rotating stool with one eye directly over the axis of rotation and conclude that there's nothing special about it. Figure 6: Schematic of Be Now Here camera system. 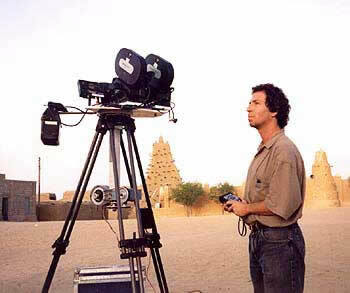 The camera system was based on two 35mm motion picture cameras, the kind used in professional movie production. These cameras have higher spatial resolution and dynamic range than conventional video cameras and are far more robust under extreme and remote environments. The cameras were synchronized to run in phase at 60 fps (rather than the standard 24 fps) and had variable shutters that could close down to 30 degrees, resulting in an effective shutter speed of 1/720 second, fast enough to freeze most everything. High quality Zeiss lenses were used with very wide-angle 60-degree horizontal FOVs. Partly for practical reasons, the cameras had to be mounted with the lenses separated by 8 inches, resulting in a "hyper-stereo" effect due to the exaggerated interocular distance. The camera system was, by choice, approximately 7 feet from the ground. The result would be a slowly rotating stereoscopic movie with high spatial and temporal resolutions, an immersively wide FOV, and a viewpoint resembling a very tall person with a very big head. The entire system, including cases, weighed 500 pounds but was built to travel. All production took place in one rather insane month flying around the world (Naimark, 1995). A digital audio recorder with a shotgun microphone was used to collect sounds at each site for later mixing into 4 channel rotating sound. Enough stock to film 5 panoramas (10 reels of 400' film) was taken to each site. Miraculously, production stayed on schedule and everything came out. The film footage was transferred to videotape, edited, and mastered onto laserdiscs. For playback, the ideal solution may have been to rotate the stereoscopic image around the viewers like the previous moving movies. But in order for the image to appear orthoscopically correct, the rotating projectors would require 60-degree horizontal FOVs, far too wide for all but the most exotic video projectors. The solution, we surmised, was to rotate the viewers instead. 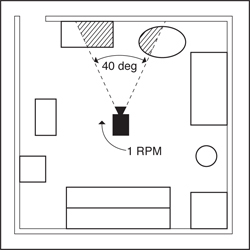 Consider: if the floor on which the viewers stand rotated in sync with the panning image, and if the speed was not too fast to be consciously detected by our vestibular system, and if the rest of the space was dark enough to minimize other frames of reference, a strong visceral illusion would result. This illusion would be similar to the feeling we’ve all experienced when our train sitting in the station seems to be moving when the adjacent train pulls out. 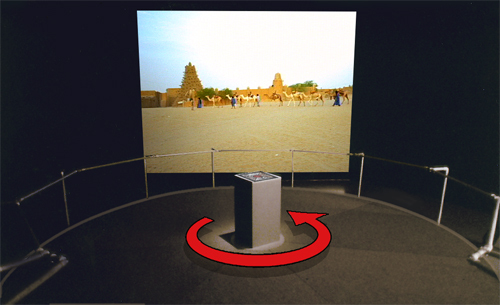 The installation, called "Be Now Here," initially employed a 16 foot diameter 1 rpm rotating floor, a 12 by 16 foot front projection screen capable of maintaining polarity, four channel surround audio, and a custom-designed input pedestal allowing viewers to interactively change location and time of day. The input pedestal was situated in the center of the floor, from which viewpoint the screen appeared orthoscopically correct. Two video projectors showed material from two synchronized, computer-controlled laserdisc players, and the viewers wore inexpensive polarizing glasses. Figure 8: Installation view of Be Now Here. The overall effect worked, but a small percentage of viewers complained of vestibular problems, dizziness, from the rotation. After two public exhibitions, informal tests were made back at Interval slowing down the floor and motion picture together to one half and one quarter of the original speed. At half speed, the "moving train illusion" remained strong but the dizziness disappeared for most everyone tested, and at quarter speed, the illusion largely disappeared (Naimark, 1997b). The video was re-edited for half speed and the sound was re-mixed, resulting in slow motion imagery with real time surround sound. Incredibly, very few viewers were aware that the footage was slowed down. It was also felt that the more visible cues of the actual (non-rotating) space could be masked, the more effective the illusion would be. The entire installation was enclosed with a black cylindrical wall, using a simple cage structure from which back drapery could be suspended. This modification required changing from a front screen to a rear screen, and fortunately for us, an inexpensive, flexible rear screen material that maintains polarity had recently become available. The original 12 by 16 foot front screen was replaced by a 9 by 12 foot rear screen and placed correspondingly closer to keep the FOV orthoscopically correct, approximately 12 feet from the center of the floor. Now viewers could come as close as 4 feet to the screen. Surprisingly, few viewers seemed bothered, or even aware, that their eyes were accommodating much closer than what would be consistent with the landscape imagery, and the feeling of immersion remained. 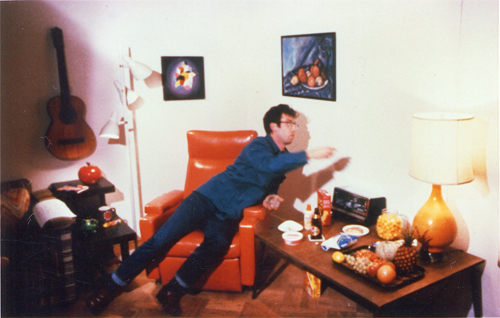 Interval was granted a patent for the Be Now Here immersive illusion in 1997 (US 5,601,353) and the footage was "mined" for other research applications. For example, Paul Debevec, then an Interval intern from UC Berkeley, filmed squares and cubes covered with checkerboard material, which he and several other computer vision researchers used to explore panoramic tiling, background subtraction, and depth from stereo. Romy Achituv, another Interval intern from NYU, made a screen-based interactive version of Be Now Here that combined different times and places into a single panorama (Achituv, 2000). 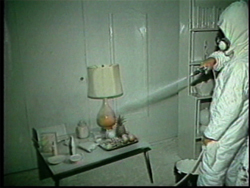 Students at MIT and UNC also used the footage for various experiments. Most recently, the footage was used to simulate what "VR Webcams" might be like (Naimark, 2002). Be Now Here continued to exhibit in venues including technical (Siggraph, 1996, and the Tech Museum of Innovation, 1998), cinematic (Rotterdam and San Francisco Film Festivals; 1998, 2001), and art (Art at the Anchorage NY, 1997 and Kiasma Museum of Contemporary Art Helsinki, 2003). But, happily, it is not without company: a lively community of media artists continues to push the boundaries of cinematic forms in a still-ossified giant industry, ripe as ever for challenge and expansion (Shaw and Weibel, 2003). Displacements and Be Now Here share several common features but also some major differences. Both were attempts to make immersive virtual environments, particularly using motion picture media with 3D and panoramic components. Both were exploring radically different ways of experiencing cinema, and both had little concern for generalization beyond the art installations themselves. The most top-level observation is that the eye is incredibly difficult to fool. Both installations attempt to make mediated experiences "just like being there." Both installations may have looked "more real" than conventional cinema or television due to higher resolution, proper orthoscopy, panoramic immersion, and stereopsis, but neither came close to passing the media equivalent of the Turing Test: "indistinguishable from the unmediated." (In fact, no visual media, including 3D Imax, can.) This is a sobering lesson for anyone working in VR. The level of transparency between the two installations, i.e., the degree by which the process is visible, was nearly opposite. Displacements was completely transparent. It was obvious that the only way to have made it was to have filmed the room, then painted everything white, then projected the original film back onto everything. Even children delighted in reverse-engineering this process. Be Now Here, on the other hand, was completely opaque. Viewers put on polarized glasses, then stepped into a completely black room except for the screen (which, with the glasses, looked more like a window). They often didn’t realize the floor was rotating (why would they?). In contrast to the children’s delight learning the process of Displacements, viewers of Be Now Here were often confused and sometimes disturbed. Many reported that the actual feeling of "being there" was very strong but couldn’t understand why. Intentionally or not, both installations exploited novelty. Just as when audiences of the Lumiere’s film of an oncoming train ducked in 1895, seeing these unusual forms for the first time caught viewers by surprise. Perhaps if we were all accustomed to rotating projectors, room-size relief screens, stereopsis, or rotating floors, the novelty value of Displacements and Be Now Here would be thin. But we’re not, and exploring such unusual projection spaces is potentially boundless, given the range of possibility that new media technologies afford, with a little unfettered imagination. To explore these possibilities looking for something useful, or for a new standard, or to make a fortune, may miss the richest experiences. These may come under the province of art, even if sometimes by default. The author gratefully acknowledges that Displacements received support from the MIT Council for the Arts and the National Endowment for the Arts, and that Be Now Here received support from Interval Research Corporation, Palo Alto, and the UNESCO World Heritage Centre, Paris. Naimark M. (1984). Spatial Correspondence in Motion Picture Display. SPIE, 462. Naimark M. (1997). A 3D Moviemap and a 3D Panorama. SPIE, 3012. Naimark M. (1997). What’s Wrong with this Picture: Presence and Abstraction in the Age of Cyberspace. Consciousness Reframed Proceedings, CAiiA, University of Wales, Newport, Wales. Negroponte, N. (1981). Media Room. Society of Information Displays, 22 (2). Peleg, S. and Ben-Ezra, M. (1999), Stereo Panorama with a Single Camera, CVPR’99. Shaw, J. and Weibel, P. (Eds.) (2003), Future Cinema: The Cinematic Imaginary After Film, MIT Press. Youngblood, G (1970). Expanded Cinema. Dutton.